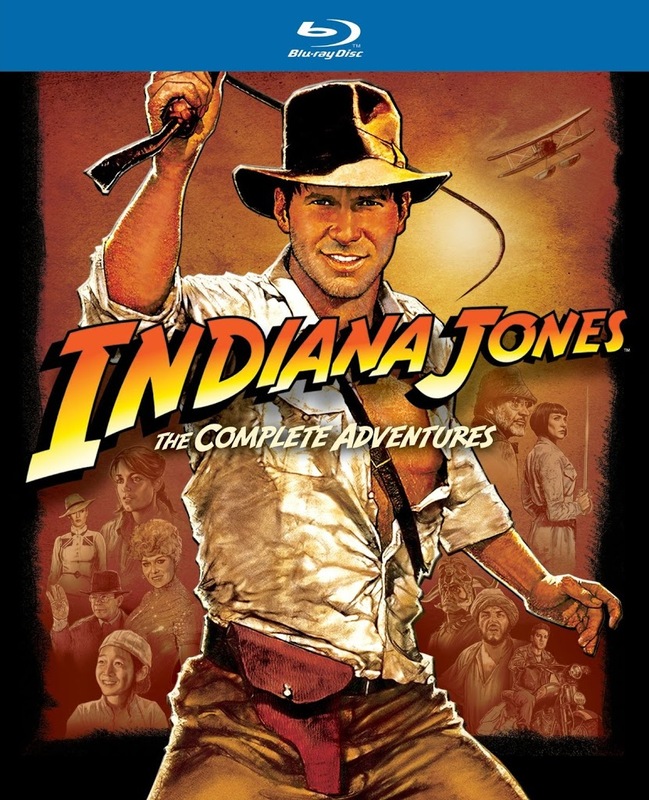 Article first published as Blu-ray Review: Indiana Jones: The Complete Adventures on Blogcritics. 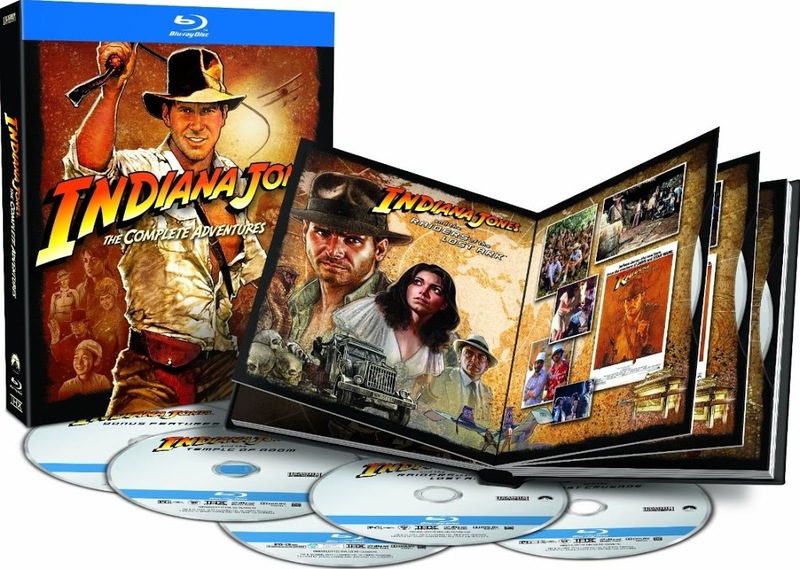 It goes without saying that Indiana Jones: The Complete Adventures, which includes all four Indy films plus a fifth disc containing bonus features, is one of the most eagerly anticipated Blu-ray releases of the year. This franchise has meant so much to so many people for the past 31 years that this box set qualifies as an event. Aside from some questionable packaging (with each disc slipped snugly into a pocket within the pages of a “book,” leaving them vulnerable to potential scratching and inevitable fingerprints), the set easily lives up to expectations. 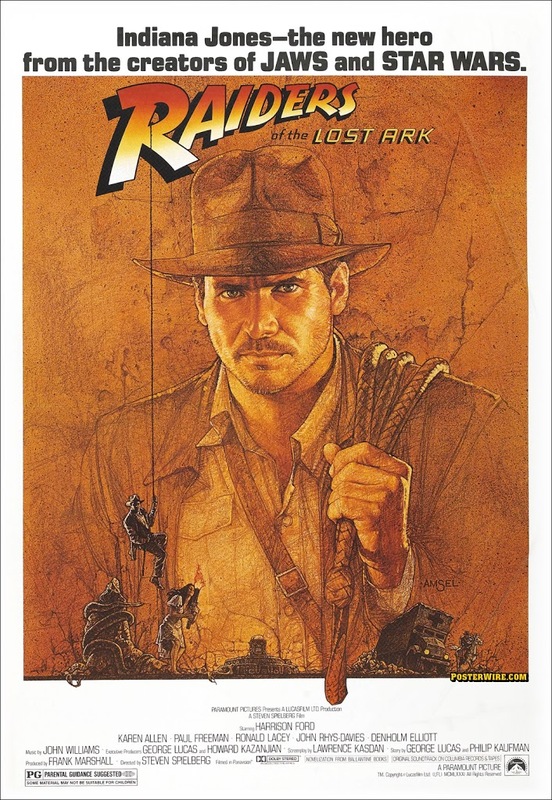 Raiders of the Lost Ark is almost universally regarded as the best film in the series, and with good reason. The film really does stand up as one of the best popcorn flicks ever made. If that sounds like damning with faint praise, consider the fact that despite all of Raiders’ iconic imagery and the charisma of Harrison Ford in his career-defining role, the film remains an ultimately slight piece of escapism. Not that there’s anything wrong with that, it just doesn’t really result in a high degree of emotional engagement or intensity, settling instead for breezy, often tongue-in-cheek fun. I think it’s an interesting point, though it doesn’t make Raiders any less entertaining. It may keep it from being a truly great film, however, depending on one’s standard for greatness. To be fair, Spielberg was not aiming for thought-provoking depth with this one. Set in the year 1936, the adventurer Indiana Jones (Ford), whose day job is teaching archaeology at a university, searches for the Ark of the Covenant—hoping to secure it before it falls into the hands of the Nazis. 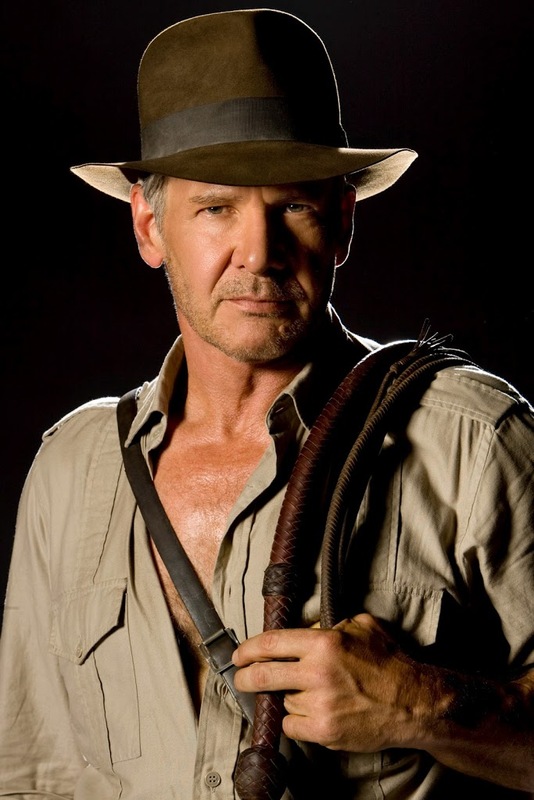 The film has definitely made its pop culture mark, with the fedora, the whip, the fear of snakes, and everything else fondly remembered about the Indy saga. Ford is great, playing not so much a character as an attitude. Karen Allen, as Indy’s old flame Marion, is a fine, feisty leading lady who was unfortunately left out of the second and third sequels. 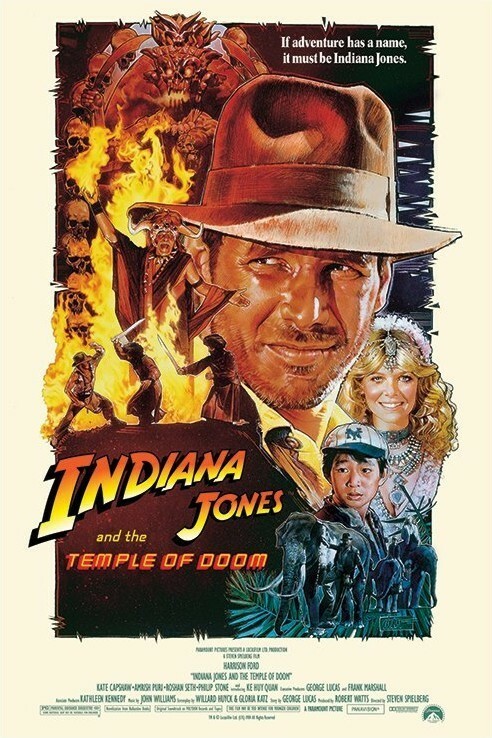 Indiana Jones and the Temple of Doom (1984) was a colossal misstep that gets by on the strength of Ford’s appeal and a handful of thrilling action set pieces. It’s a prequel set in 1935. Gone is any semblance of Indy’s double life as mild-mannered professor and daring man of action. The clear, logical storytelling of the original is replaced by a jumbled mess involving Indy’s search for a magic stone that needs to be returned to a village in India. The stone turns out to be located in the titular temple, where children are treated as slaves and sacrificial rituals are a regular occurrence. As leading lady, Kate Capshaw is an intensely annoying, shrill, whiny presence who tags along to no good effect. Indy has a sidekick this time, a child named Short Round (Jonathan Ke Quan) who at one point professes his love for Indy, yet he doesn’t factor into any of the other movies. Perhaps they had a falling out? If not, shame on Indy for abandoning him. Luckily, Spielberg and his series collaborator, producer George Lucas, rebounded in a big way with 1989’s Indiana Jones and the Last Crusade. From the opening mini-origin story (with the late River Phoenix uncannily capturing Ford’s mannerisms and delivery) to the reestablishing of Indy as a serious archaeologist and teacher, Last Crusade rights the wrongs of Temple. It’s also a bit of a rehash, with the Nazis back as villains and the search for another biblical artifact (this time the Holy Grail). Whereas Temple’s increased violence and darker edge was risky, Crusade plays it safe. But the one new element is a major success, Sean Connery as Indy’s father. Connery not only steals the movie, he inspires Ford to new heights as well. Crusade seemed to mark the end for Indy, but nearly 20 years later, the original creative team reunited for Indiana Jones and the Kingdom of the Crystal Skull. Set in 1957, the movie doesn’t shy away from Indy’s advanced age. Ford was up the challenge though, managing to capture the character’s spirit once again. The story places Indiana Jones squarely in the atomic age, with our hero becoming the unlikely survivor of a nuclear blast early on. Another plus is the return of Karen Allen as Marion, easily the best leading lady of the series. Shia LaBeouf adds a youth-oriented kick as Indy’s sidekick, Mutt. In other words, all the pieces were in place. It’s the sci-fi story that falters, but not fatally so. The earlier films all dealt with supernatural elements, but combining Indiana Jones with Close Encounters wasn’t a great idea. The artifact Indy is after this time is a skull sourced from extraterrestrials and holds great psychic powers. The villains have naturally changed from Nazis to Soviets, and Indy and company must keep the skull away from them. 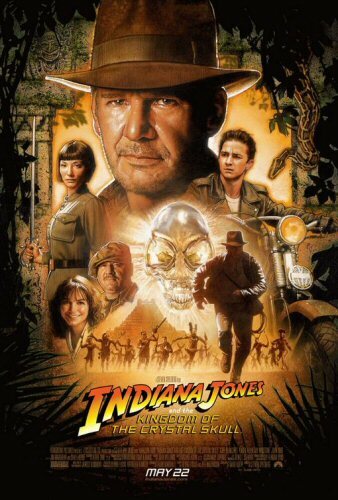 Though some of its ideas are weak, Crystal Skull functions as a nice encore to the series and is a far better movie overall than the disastrous Temple of Doom. The films all look great, with the original trilogy displaying a significant upgrade in audio/visual quality from the previous DVD versions. Crystal Skull offers less to get excited about, for obvious reasons (it’s a relatively recent production, already available in high definition). Raiders received a full restoration and, while it looks noticeably better than it has on any previous home video format, it may not be quite the revelatory experience some are undoubtedly hoping for. That said, the movie looks fantastic, with a warm, film-like look. If anything betrays the film’s age, it’s simply the look of the early-‘80s film stock. The image is exceptionally clean. There’s a very subtle softness throughout that has always been part of Raiders’ look and is apparently inherent in Douglas Slocombe’s cinematography. There is a noticeable upgrade in the overall sharpness and color saturation in Temple of Doom. Apart from the ultra-dated matte work that looks worse than ever due to the high definition resolution, Doom looks almost like a modern production. The sweaty, stubbled face of Harrison Ford has never looked so realistic. During the actual temple scenes, the intense red lighting results in a little oversaturation. Black levels are solid and detail is retained even during the dark mine shaft sequence near the film’s end. 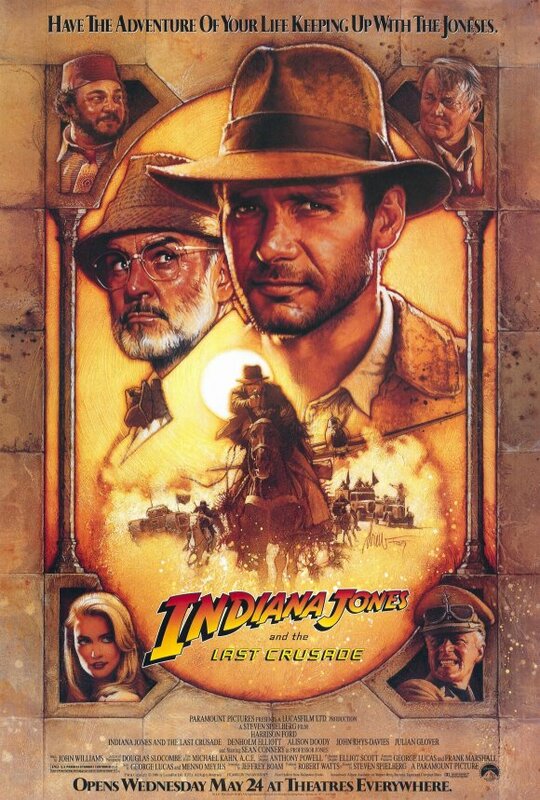 Last Crusade is similarly excellent, in fact this one arguably looks the best out of the original trilogy. In the opening flashback sequence, the red rocks and arches in Moab, Utah look absolutely stunning. As with all the films, a natural layer of fine grain provides a very cinematic look throughout. Crystal Skull already looked great on Blu-ray when it was first released in 2008. The transfer here doesn’t appear to be significantly different, if at all, but that’s not a problem because the glowing, detailed image was already so solid. Each film is presented with DTS-HD Master Audio 5.1 surround sound. They all sound incredible, with Crystal Skull understandably coming across as the most modern sounding of the four. That film’s previous Blu-ray contained a very strong Dolby TrueHD mix, and the change to DTS-HD proves a lateral move. Raiders underwent a full remix—supervised by the film’s original sound designer, Ben Burtt—utilizing the original audio elements. Perhaps the most notable upgrade is in terms of LFE activity, with every crack of Indy’s whip resonating deeply. This is a very active mix, with near-constant engagement in the surrounds, be it with effects or John Williams’ score. Never betraying its age, the dialogue is clear, centered, and always intelligible. Temple of Doom and Last Crusade are also on par, as all of the above accolades apply to them as well. Effects are well placed throughout, just listen to the around-the-spectrum popping of corks during Temple’s opening nightclub sequence. Even during the din of the temple scenes later in the film, all elements are perfectly balanced. Directionality improves even more with Crusade, as automobile noise and other effects pan from channel-to-channel even more convincingly than the earlier films. All in all, this is a great sounding series of films. I’ll cut to the chase regarding special features, since most of them are ported over from the 2003 and 2008 DVD box sets and the 2008 Crystal Skull Blu-ray. What is new might not be extensive, but it is certainly worthwhile. “On the Set of Raiders of the Lost Ark” is a documentary in two parts (“From Jungle to Desert” and “From Adventure to Legend”) that together runs about one hour. The great thing is this isn’t a retrospective piece. All of the footage was shot on-location during the production of Raiders. Throughout the piece we see deleted scenes, alternate takes, and outtakes. And at the very end we are also treated to a few minutes of deleted footage from each of the sequels. Also new to this set is the vintage 1981 documentary “The Making of Raiders of the Lost Ark,” which also runs about an hour. This is not the standard, fluffy promotional piece it might sound like—this is basically more of what we see in “On the Set” (with a few clips here and there repeating). There’s lots of on-set material that helps convey Spielberg’s directorial process. While the sequels wind up all but ignored as far as the new material is concerned, the nearly two hours of previously unavailable supplements constitute a fan-pleasing, fly-on-the-wall look at the making of Raiders. The primary feature from the 2003 DVD set, the two hour “Making the Trilogy” documentary, is included, albeit split into three parts. Most of the assorted featurettes from that set and the 2008 set are included as well. The biggest loss is the absence of most of the features that were present on the Crystal Skull Blu-ray. All we get for that film is an edited “making of” that runs about a half hour plus three featurettes, “Iconic Props,” “The Effects of Indy,” and “Adventures in Post-Production.” If you’re a completist, you’ll definitely be holding onto your standalone Crystal Skull Blu-ray. With all four feature films looking and sounding terrific, plus two hours of supplementary material never before available, Indiana Jones: The Complete Adventures is an outstanding Blu-ray set. Apart from the exclusion of those previously available features for Crystal Skull, my only complaint is the box itself. I don’t like when discs are packaged in sleeves, pockets, or anything else that makes contact with the disc surface. I don’t think I’ve ever heard anyone else say they like this type of packaging either, so it continues to surprise me that some distributors continue doing this. Of course, it’s easily remedied by storing the discs in separate cases. I wouldn’t let it dissuade you from picking up the set if you are a fan.